*The amount of broth or water required will depend upon the rice you are using; use the appropriate amount according to the directions on the package. For this dish, I use white basmati rice and 1 cup uncooked basmati rice requires 2 cups of broth or water. In a large saucepan, bring the broth or water to a boil. Add the butter or margarine, rice and onion. Stir well, cover, reduce heat to a simmer and cook for the amount of time suggested on the rice package. Meanwhile, while the rice is cooking, prepare your cheese melt and set aside. Preheat the oven to 350°F. During the last 10 minutes of cooking time for the rice, add the vegetables on top of the rice and replace the lid. Do not stir! The vegetables will steam while the rice completes cooking. 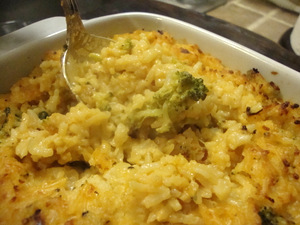 Stir the cheese melt into the rice/vegetable mixture and season with salt and pepper to taste. If the mixture seems a bit dry, stir in small amounts of soymilk in increments until the desired consistency is reached. Transfer the mixture to a lightly oiled casserole dish, cover and bake for 30 minutes. Uncover the casserole dish, set the oven on broil and lightly brown the top of the cheesy rice mixture under the broiler, about 5 minutes. Serve immediately.